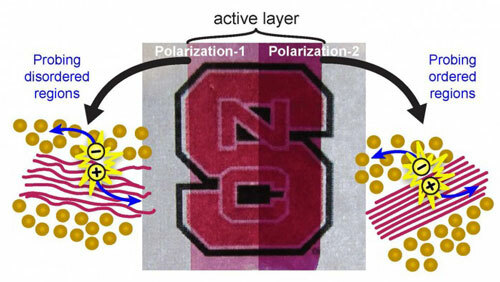 (Nanowerk News) A research team led by North Carolina State University has developed a new technique for determining the role that a material’s structure has on the efficiency of organic solar cells, which are candidates for low-cost, next generation solar power. The researchers have used the technique to determine that materials with a highly organized structure at the nanoscale are not more efficient at creating free electrons than poorly organized structures – a finding which will help guide future research and development efforts. Broadly speaking, organic solar cells convert light into electric current in four steps. First, the cell absorbs sunlight, which excites electrons in the active layer of the cell. Each excited electron leaves behind a hole in the active layer. The electron and hole is collectively called an exciton. In the second step, called diffusion, the exciton hops around until it encounters an interface with another organic material in the active layer. When the exciton meets this interface, you get step three: dissociation. During dissociation, the exciton breaks apart, freeing the electron and respective hole. In step four, called charge collection, the free electron makes its way through the active layer to a point where it can be harvested. In previous organic solar cell research, there was ambiguity about whether differences in efficiency were due to dissociation or charge collection – because there was no clear method for distinguishing between the two. Was a material inefficient at dissociating excitons into free electrons? Or was the material just making it hard for free electrons to find their way out? To address these questions, the researchers developed a method that takes advantage of a particular characteristic of light: if light is polarized so that it “runs” parallel to the long axis of organic solar cell molecules, it will be absorbed; but if the light runs perpendicular to the molecules, it passes right through it. The researchers created highly organized nanostructures within a portion of the active layer of an organic solar cell, meaning that the molecules in that portion all ran the same way. They left the remaining regions of the cell disorganized, meaning the molecules ran in a bunch of different directions. This design allowed the researchers to make the organized areas of the cell effectively invisible by controlling the polarity of light aimed at the active layer. In other words, the researchers could test just the organized section or just the disorganized section – even though they were on the same active layer of the same solar cell. Because the charge collection would be the same for both regions (since they were on the same active layer), the technique allowed the researchers to measure the degree to which structural organization affected the material’s dissociation efficiency. “We found that there was no relationship between dissociation efficiency and structural organization,” O’Connor says. “It was really a surprise, and it tells us that we don’t need highly ordered nanostructures for efficient free electron generation.